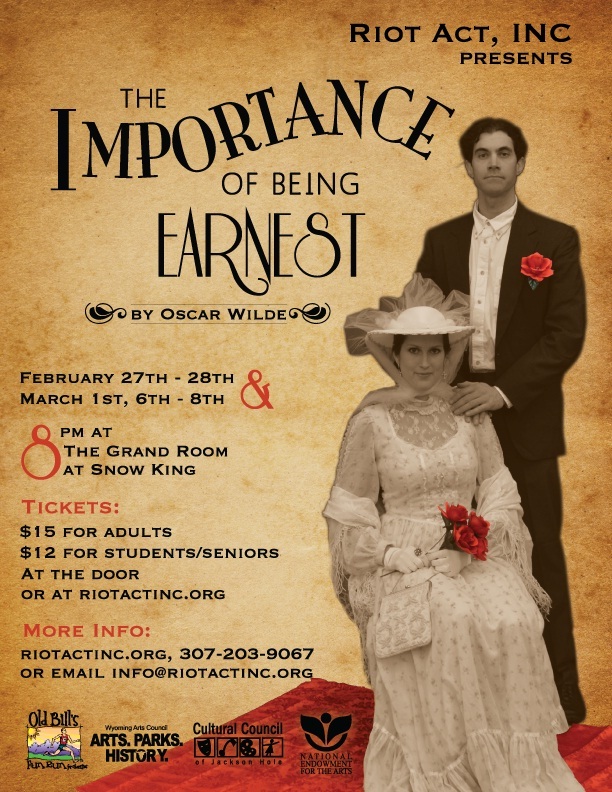 The Importance of Being Earnest – Riot Act, Inc.
Riot Act, Inc. presents The Importance of Being Earnest by Oscar Wilde Thurs. Feb. 27 to Sat. March 1 and Thurs. March 6 to Sat. March 8 at 8:00pm in the Grand Room at Snow King. Jackson theater veteran Cynthia Huyffer directs this satire of Victorian culture with plenty of mistaken identities and slapstick romance. Our wonderful cast includes P.J. Buckles, Lindsay Burgess, David Dell, Curt Haws, Leah Holmes, Leigh Hunter, Graham Koten, Lynne Matthews, Frankie McCarthy, and Linda Rode. 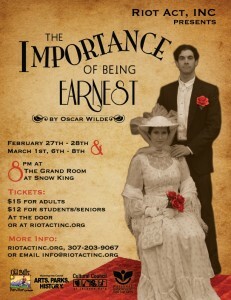 First published in 1895, The Importance of Being Earnest is Oscar Wilde’s most famous play, filled with clever phrases and smart quips about Victorian society. This comedy follows Jack and Algernon – members of the English aristocracy bound by the rules of Victorian morality – bend the truth to create excitement in their lives. As they each fall in love, their little white lies are turned on end and must be righted to win their betrotheds. Dinner and pre- and post-show beverages will be available directly from Snow King in Haden’s Post. Riot Act, Inc. T-shirts, and Run-of-Show raffle tickets will be available for purchase at the concession stand. Raffle tickets are $5 for one or $20 for five. Tickets are available in advance on our website at www.riotactinc.org or at the door: $15 for adults or $12 for students/seniors. For more information, contact info@riotactinc.org or 307-203-9067. *Project made possible by grants from Wyoming Arts Council/NEA, Cultural Council of JH, Old Bill’s Fun Run, and your donations and support.